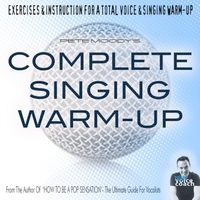 The complete singing warm up with daily exercises and optional instruction included to develop any vocal style. The ideal way to warm up your voice a get fully prepared for singing. Learn ‘how to’ with the Buddy Tracks and then practice with the exercise tracks. Get a great warm-up workout whilst developing musicality and performance components. Designed with singers for singers. Free your vocal and shape your sound with professional technique suitable for every singer. All tracks designed and instructed by Voice Coach Pete Moody. Also featuring the voices of Emily Clare and Katie Rayner. it now and enjoy it is also great fun.